I am a Scanner, and I just found out. Now, finally, things are starting to make sense careerwise. The fabulous Barbara Sher (ever watched her shows on PBS? Do yourself a favor!) says about us Scanners, "You are the owner of a remarkable, multitalented brain trying to do its work in a world that doesn't understand who you are and doesn't know why you behave as you do". And she describes her book as "a set of instructions" to help us find our way. Scanners (we scan the horizon for many interests) are aplenty and it's so exciting we're not alone. Not mad. Not crazy. A task we're given in the book is to create a Scanner Daybook to fill in with ideas, both written down and visuals. This is to encourage you to keep your ideas alive, even if they never amount to anything. There is also a list of 1,000 things you want to do before you die and an Interest Index Binder (she suggests you have upwards of twenty binders!) and a Portable Dream Deck. Much too much recorded scrutiny for my liking I have to say. Chapters Ms. Sher has written include "Scanner Panic", "Commitment Phobia", "I Won't Do Anything if I Can't Do Everything", and "I'll Never Finish Anything". The second half of the book asks the question, "What kind of Scanner Are You?" and is broken down into eleven chapters. There are signs and behaviors to look out for in ourselves. I found this interesting: "When you lose interest in something, you must always consider the possibility that you've gotten what you came for; you have completed your mission". We're also shown how to find a job that won't bore us - yippee! The sad thing for me, is that I'm at the point where I stop trying anymore - recent failures haven't helped. 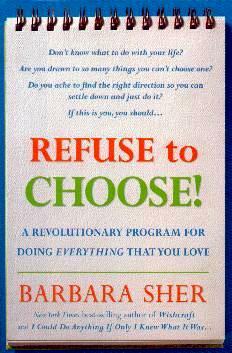 Visit Barbara Sher's website at www.barbarasher.com. Conclusion - I prefer to watch Ms. Sher on her television shows. I didn't finish this book.